Those who suffer any sort of trauma encounter shock and bewilderment in its wake, their mind constantly replaying and responding to events long after they have passed. It’s like some sort of addiction that you just can’t shake off. All the time, a sort of personal in-body emergency team keeps you going while trusted voices urge you to come to terms with the past. Welcome to Betroffeheit. The German word has no direct equivalent in English. It describes a state of shock but has another aspect too, the total separation of mind and body following severe mental stress or pain. To the outsider it may seem like a silent place. To the insider it’s full of never-ending sights, sounds and voices. In 2009, Jonathon Young lost his teenage daughter her two cousins in an accidental fire on a family holiday. 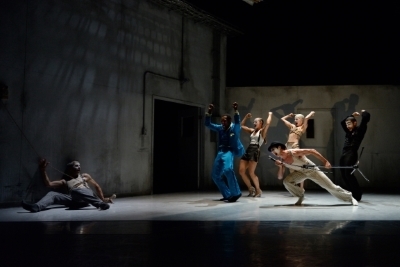 Together with choreographer Crytsal Pite, in Betroffenheit he explores his personal trauma. They take us a that place deep in his psyche, a room that can only be visited by him. Designed by Jay Gower Taylor, that room, Young’s post-traumatic home, is timeless. There is no calendar, no clock. It looks like a place in a dingy asylum; bare and clinical. There are doors, but they just lead into never-ending darkness. Cables lay across the floor. They slither and rise like snakes. Lights flash. Like the dance that is to come, it’s a metaphor for his anguish. At first, Young is alone. He keeps suffering “chronic re-entry.” As he talks and relives events, it’s a conversation, a duet, with himself. It’s real but not real. Like dripping water that cannot and will not stop, it tortures his mind. But whatever he does, the pain cannot stay hidden for long. It’s raw. And it reaches out to us watching, who are riveted, wondering where this might lead. Young’s inner voice, his alter ego, in many ways his minder, is also played to devastating effect by Jermaine Spivey. He rebukes him, he scolds him, he torments him. The room is populated by five figures, human, but with faces whitened, eyebrows drawn strangely high and red lips. They cry black tears. These sinister clowns are born of Young’s attempts at distraction. The room becomes a place for a party, a cabaret stage and a television light-entertainment show set. As they dance, joints pop and lock as body parts move in isolation. Mouths scream silently, Munch-like. Whenever the cancerous memory returns, as it inevitably does, they relive the event. Not only is lip synch is used frequently, but the text becomes the dance too. Pite and the brilliant Kidd Pivot dancers superbly describe Young’s situation in movement. They tap, they salsa, they manipulate puppets. Words become movements, grammar and punctuation become limbs as the dancers follow their rhythm, twisting and contorting themselves as they do so, just like Young’s pain, pain that will not go away. And yet, there is hope, a future. Young will never forget, his mind will always be damaged, but slowly he rebuilds himself. Slowly he is released from the hell that is his room and his demons. In Act Two, the room literally melts away to be replaced by a gloomy monochrome scene dominated by a roof-high central pillar. Back lighting is used to striking effect, casting a huge shadow, dividing the stage and perhaps, reflecting the two sides of the brain. With the dancers now in loose clothing, Pite’s frequently gestural choreography is pure movement, fierce and powerful. The dance is typical Pite, fractured and sculptural, exploding and rolling across the stage with a lot of use of support. A duet between Cindy Salgado and Tiffany Tregarthen was especially memorable, so together in unison they were as one. There are references back to Act One, but also more a sense of support, of helping Young find that all too elusive way out, or at least come to terms with what happened. Betroffenheit is one of those rare pieces that stays with you. Young, Pite and the dancers create a movement language that so movingly and persuasively expresses Young’s inner torment, grief and pain. They make the invisible, visible. But they also show that there is hope. There is a way out.